Fifty years ago today, the New York Mets threw the club’s first no-hitter, with Gary Kroll and Gordie Richardson combining for nine innings of no-hit ball during a 6-0 spring training game against the Pittsburgh Pirates in St. Petersburg, Florida. 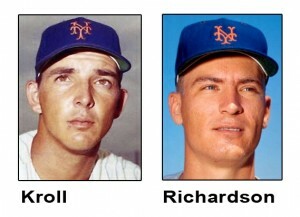 Kroll pitched the first six innings on March 22, 1965, walking three batters in the first inning. Richardson threw the last three frames, with Del Crandall reaching first in the eighth inning on an error by shortstop Roy MacMillian.